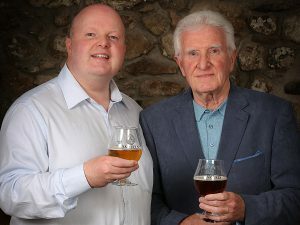 Our beers will appeal to those who are willing to explore the best of local produce, who care about quality and provenance, who enjoy spending time with friends and family and who are willing to try something new. They are the explorers who travel to other countries and ask to try the local beer over a big international brand. There is a time for ‘big brewery’ beer. Now is the time for craft. Our inspiration is two-fold. Firstly, our beer reflects the best of beers tasted on travels around the world, with a particular favourite being the small breweries in Southern Germany. Sitting in the beer garden of a small town Bavarian brewing pub on a summer’s evening enjoying a ‘Seidla’ (half litre) of the local beers is an experience that will leave a lasting impression. We hope our beers do too. Secondly, the man himself; Samuel (or Sam), my dad. The man that first introduced me to ale and is an ale drinker to this day. He represented his country in snooker and billiards championships and at one time was Northern Ireland and All-Ireland champion, going on to represent Ireland in two World Championships. He is a shining example of starting from humble beginnings but working hard to beat the competition and be the best he could be. I hope that I can follow that example and make Samuels Brewing Company the best it can be. I invite you to join us on the journey.